An Antineoplastic (hormonal) Raw Materials. Usage: An antineoplastic (hormonal) raw materials. 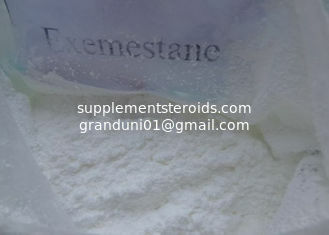 Aromasin (Exemestane) is a Type-I aromatase inhibitor, or suicidal aromatase inhibitor. It's called this because it lowers estrogen production in the body by attaching to the aromatase enzyme, and permanently deactivating it. Personally, I find this to be a very interesting mechanism of action when compared to type-II aromatase inhibitors, which bind competitively to the aromatase enzyme, and eventually unbind, rendering it active again. In the case of Aromasin, this doesn’t happen, and once it does its job on the enzyme, those particular enzymes will no longer function. Your body will eventually create more of the aromatase enzyme, so this isn’t dangerous, despite the really odd “suicide” thing in the first paragraph. As with all aromatase inhibitors, Aromasin was developed to fight breast cancer primarily in post-menopausal women, but we in the athletic community use it to combat estrogenic side effects from aromatizable steroids. Estrogen is responsible for many of the effects we’re trying to avoid when we’re on a cycle, including excess water retention and development of gynocomastia (breast tissue development in males. Thus, limiting the conversion of testosterone into estrogen is of use for steroid using athletes, when they’re trying to avoid side effects. In this case, the advantage of using a suicidal aromatase inhibitor is that it really won’t cause much, if any, noticeable “rebound” in estrogen when you cease using it.